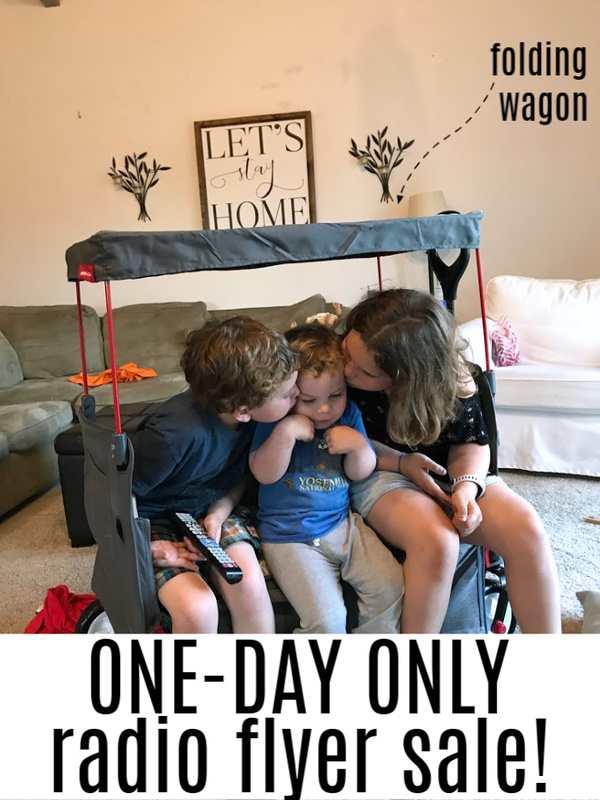 Inside this post, you’ll find details on National Little Red Wagon Day and how to get up to 30-50% off your purchase of a wagon during this amazing, one-day sale! Radio Flyer wagons truly represent good old fashioned summer fun – am I right?? That’s why I’m thrilled, THRILLED, to be working with Radio Flyer because I get to tell you that today, Wednesday, March 27th, is National Little Red Wagon Day! What’s the mean for you?! Before we being, I’ve got to tell you that this little wagon of ours isn’t red. Can you see it up in the photo?? It’s actually grey. But, it’s still allllll Radio Flyer! 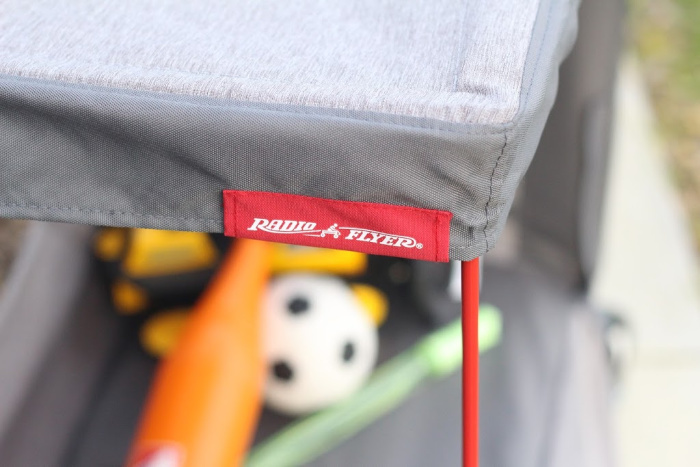 We were lucky enough to score the ultimate folding wagon that is all grey canvas complete with a side that zips up and down so kids can easily climb inside. 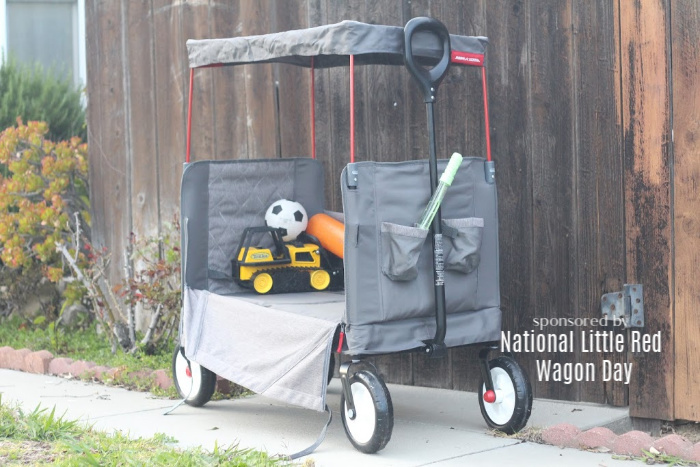 The wagon also sports a collapsible canopy, so on extra hot days, your kids will be nice and cool. I just could not love this wagon more. In fact, my kids loved it so much that they zipped down the sides, put pillows inside, and watched a movie together. I mean, it was just too cute!! 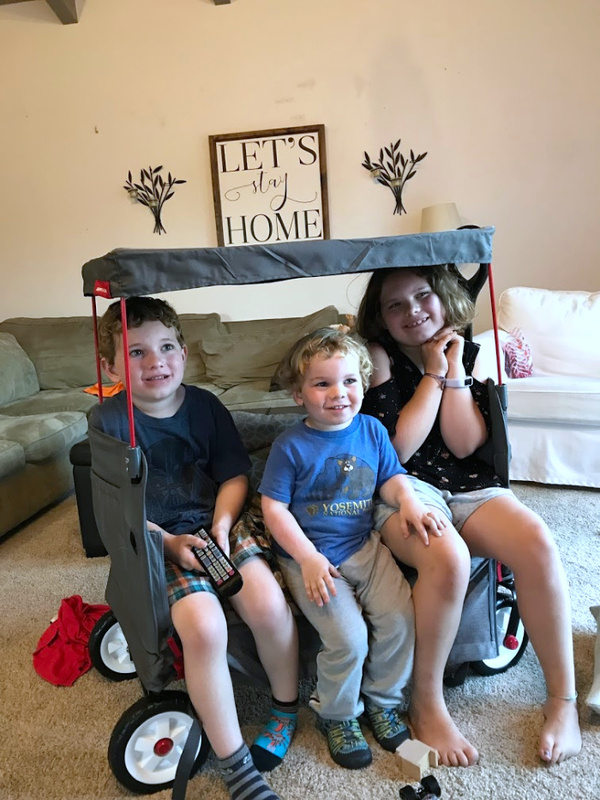 BUT, Radio Flyer is going above and beyond to make sure that there are smiles for miles as we are getting nearer to summertime, by opening a one day sale on their site. You’ll find discounts at Radioflyer.com for these wagons between 30-50% off!! What I love is that this is Radio Flyer’s fourth annual National Little Red Wagon Day because they want to say thank you with a discount to remember. There’s nothing that will celebrate the weather getting warmer and spring officially beginning than a way to encourage our kids to get outside, get active, and go wherever their imaginations take them. Just like our wagons did for us as kids. So, go! Run! And, utilize this amazing one-day-only discount to get your new ride for this summer at a great price because #timefliesenjoytheride. For more info, check out our Instagram post with all the details. A huge thank you to Radio Flyer for sponsoring this post and for creating an amazing sale for us today! Check Radio Flyer out on Instagram, Twitter, and Facebook to stay up on the latest info on Radio Flyer.